What do you do when you know that many, many dogs are going to be euthanized at high-kill shelters in San Bernardino, CA, and the transport vehicles that usually bring dogs to Seattle are broken down or fully booked? If you’re Jenny Nordin, founder of Dog Gone Seattle (DGS), you rent a van, set it up with crates and supplies, and drive 2,376 miles to rescue as many dogs as possible and bring them back to Seattle. What else? Jenny’s dilemma, and master scheme, began before the 4th of July this summer. The holiday always causes major crowding at animal shelters throughout the country as dogs frightened by the fireworks bolt from their homes and are picked up as strays. To make room for them in the shelters, many of the current residents—perfectly wonderful, adoptable dogs—are euthanized. It’s a little known and tragic fact. Letting that happen was just too heartbreaking. So Jenny’s first step was to email her DGS board members. Was anyone up for a little road trip to rescue dogs? Ashlyn Kauh said “I’m in. We have to do this!” and Jenny had her sidekick. But choose they did—dogs of all shapes and sizes and personalities. While she and Ashlyn headed south in the van, DGS rescue partner Terri Raymond in San Bernardino was hard at work on her end. She rounded up all the chosen dogs and got them to the vet for the health checkups they needed to join DGS. 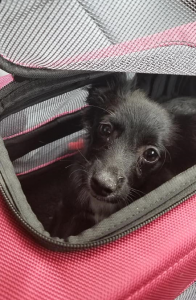 Jenny and Ashlyn left Seattle at 2 p.m. on Sunday, July 8, timing it so they’d get to San Bernardino right when the vet’s office opened on Monday morning. “We drove straight through, just stopping four times for gas,” recalls Jenny. out and ready to go,” she says. Nineteen of the dogs were loaded into crates in the van and given ice water. Petal, one of the spaniel puppies, got the honor of riding shotgun between the two front seats. Jenny, Ashlyn and the van full of dogs finally reached Seattle at 12:30 p.m. on Tuesday, July 10. The whole trip had taken a little less than 48 hours. Since landing in Seattle-area foster homes, the dogs have been recovering from shelter life, learning basic obedience skills, and attending adoption events to find their forever homes. A month after the rescue mission, 16 of the 20 dogs were already adopted. Now, just two – Luna and Chip – are waiting for forever homes. Great article and touching video showing each and every dog rescued. Endless applause to everyone involved for their spontaneity and commitment, and sincere admiration for the selfless work and many lives you save.